WE NEED YOUR HELP! And it’s a simple, easy request that will go a LONG way to help the teachers and children of Atlanta. Turnkey Construction is partnering with IREM to help support local Atlanta teachers and children get the school supplies they need. We are helping deliver No. 2 standard pencils to the Kids in Need foundation. 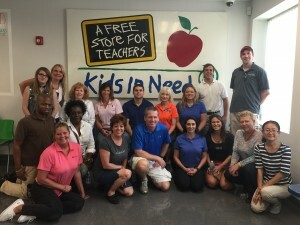 Turnkey President Deanna Navarro-Ek (back row fourth from left) pictured with IREM and other community leaders taking part in the Kids In Need pencil drive to help provide school supplies for Atlanta teachers and students. The average child uses 48 pencils per year. Keep in mind that the average teacher spends about $500.00 per year out of their own money to make sure their students have the school supplies they need. And we all know that teachers don’t make enough to begin with, so this is an especially heavy burden. 1. SEND No. 2 STANDARD PENCILS. You can ship them directly to us at: Turnkey Construction & Roofing, Attention Jarrod Parr, 2100 Main Street NW, Atlanta, GA 30318. Even if you can only donate one pencil, please help. Every single donation helps and is much appreciated. 2. SEND A MONETARY DONATION. If you prefer to send a monetary donation, please mail a check to the address above, made out to Turnkey Construction & Roofing (please indicate in the memo line “Children in Need Donation.” ALL money received will go directly toward purchasing pencils. We are more than happy to provide you a receipt for your generous donation if needed. Just let us know when you send the check. ALL donations will be given to Kids in Need so that local metro Atlanta and surrounding counties teachers can get the supplies they need. A special thanks goes to our first donation received this morning from Florida for 720 pencils! If you have any questions, please contact Jarrod Parr, Production Manager at Turnkey at (770) 403-4181 or (404) 799-7902. Thank you in advance for your consideration and donations. Let’s make a difference for our teachers and students in need!